2,700 kilometers is a long way from home. The six-hour flight across the American border may be daunting, knowing that you’ll basically have to start a new life, make new friends and wonder how you’re going to fit in once in town. Unfamiliarity and unavoidable awkwardness as a foreigner is inevitable. 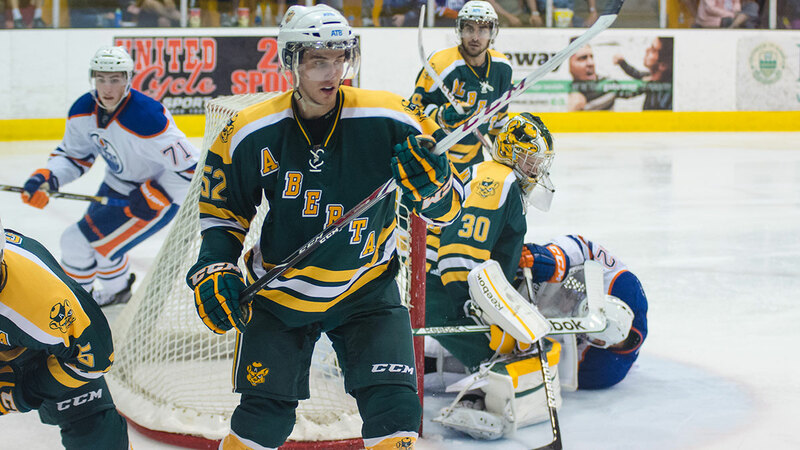 After five years suiting up for the Green-and-Gold, leaving Edmonton, AB behind for Cincinnati, OH was difficult for Brett Ferguson. 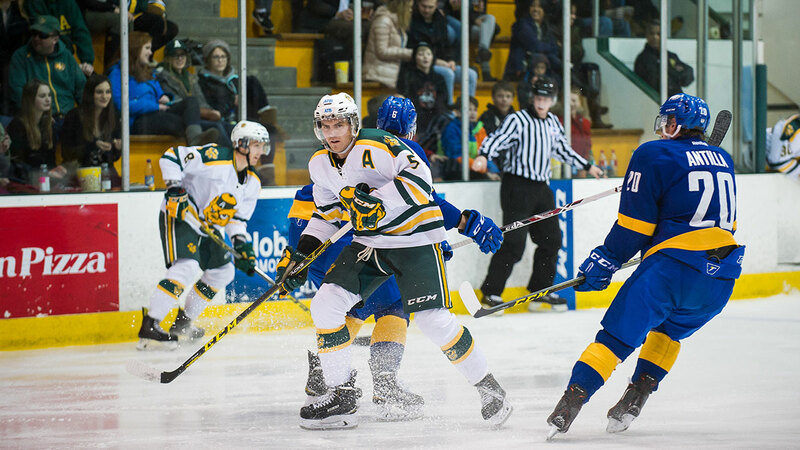 A mainstay at left wing for the Golden Bears, Ferguson averaged 30.3 points in his last three seasons at the U of A, annually ranking him among the top scorers in the Canada West. He was what Bears head coach Serge Lajoie called a “players’ coach” in the locker room, and an unquestioned leader. But none of that really matters in Cincinnati. Having a friend in that alien locker room is helpful. Having a family member is even better. Joining Ferguson in the Cyclone organization is fellow Bears alum Levko Koper, a former seventh-round pick by the then-Atlanta Thrashers in the 2009 NHL Draft. 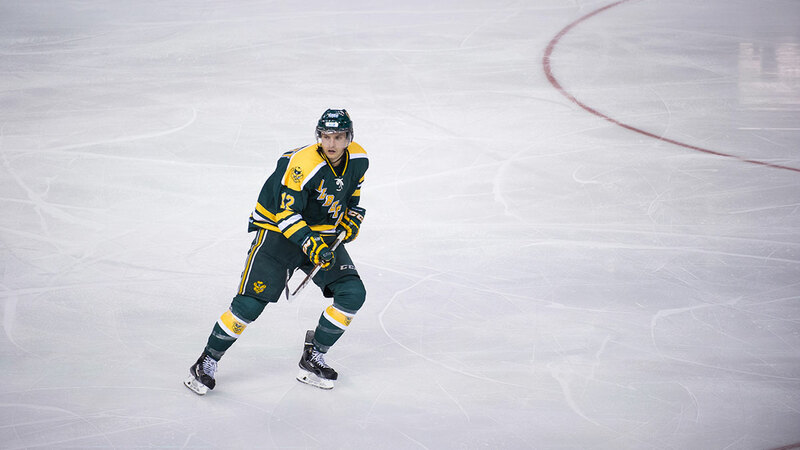 Despite scoring the first Winnipeg Jet goal in 15 years at the Young Stars rookie tournament in 2011, Koper wasn’t offered a professional contract by the organization and turned to the CIS, and his hometown Golden Bears. 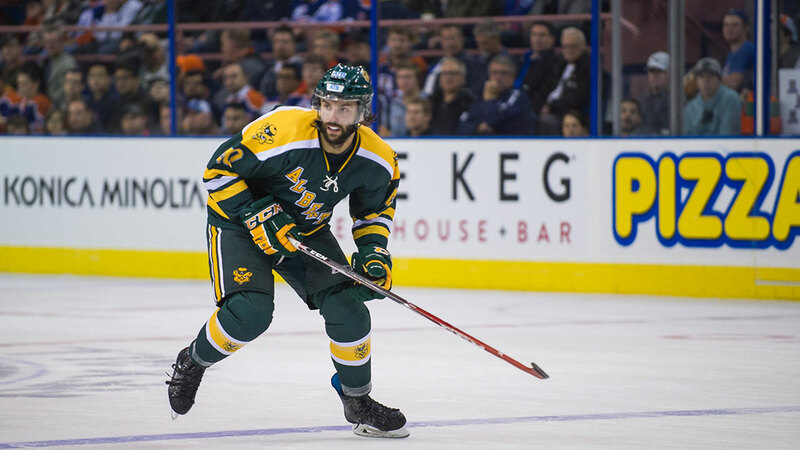 After netting at least 25 points in each of his five seasons at the U of A, Koper looked to turn pro as his CIS eligibility expired. Koper received offers from a “handful” of professional hockey teams in North American, but Cincinnati was the best fit for the former U of A star. Partly, if not mostly, for Ferguson being there. “We thought it would be a great opportunity to be together and make it a little easier,” Ferguson added. After Koper and Ferguson signed their pro contracts, the Cyclones offered them something a little more reminiscent of home — an apartment together. Having that familiarity and feeling of comfort has made the trip to professional hockey much smoother for the two alums. 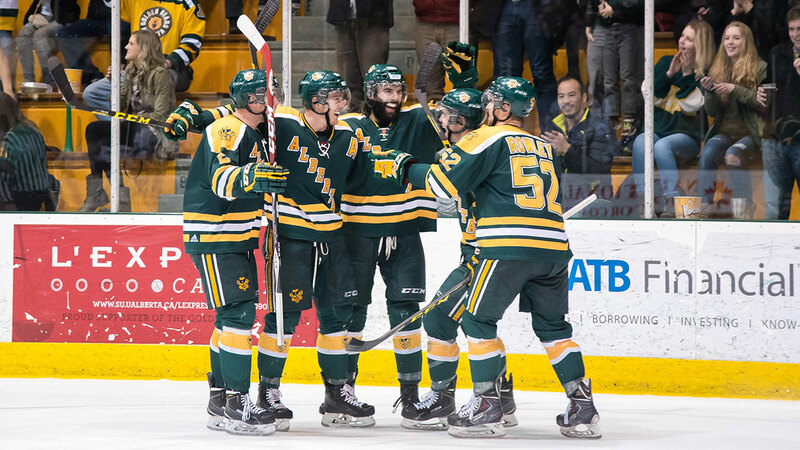 Koper and Ferguson rarely played on the same line at the U of A, and only occasionally shared the ice on penalty kill units, but the bond the two formed as Golden Bears was invaluable. Though they’ve been in the ECHL for just one week, they’ve realized how often organizations make trades and free agent signings, as players often come and go. Every couple of months, a new face appears in the locker room, and the two former Bears are no different. Looking back, it’s made the five years at the U of A that much more meaningful. “There’s no team I’ll ever go to where you’ll be that close to a group of guys for so long,” Koper said. After four contests with the Cincinnati Cyclones, Levko Koper has assisted on three Cyclones goals. In two games, Brett Ferguson has zero points, and a plus one rating. One look into the Clare Drake Arena rafters, and Kruise Reddick was sold. 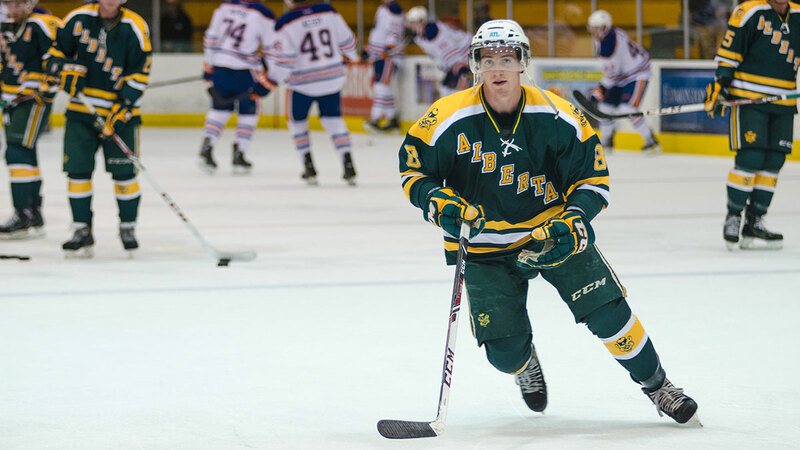 The 20-year-old Reddick, fresh off a 68-point campaign with the WHL’s Tri-City Americans, traveled to the storied Clare Drake Arena from Manor, SK in 2011 while on a tour with Golden Bears hockey general manager Stan Marple. The young centre was looking for two conditions in his university hockey program search: to be able to win, and be able to play pro hockey afterwards. Marple guaranteed Reddick both. It was likely something that most prospective programs promised Reddick, but after seeing the 13 national championship and 21 conference championship banners hanging from the ceiling first-hand, he knew he found his new home. 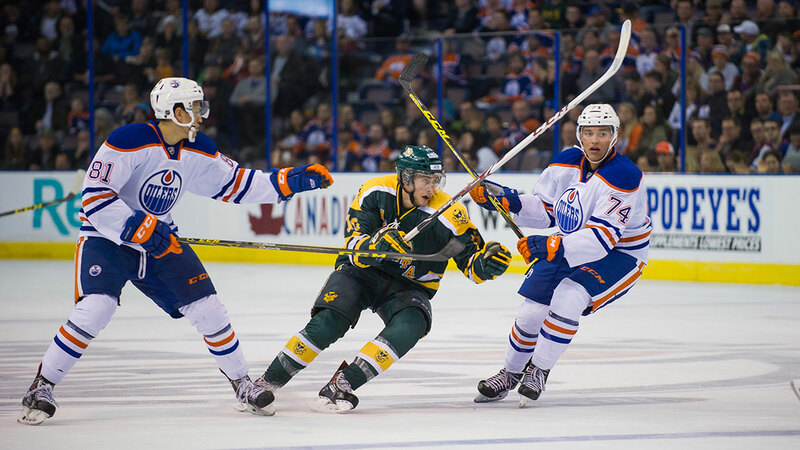 There’s too many memories to name, many of which are difficult to put into words for the now 25-year-old star when looking back at his Golden Bears career, but that first trip to Edmonton will always stand out in his mind. Before his rookie season, Reddick dreamed of donning the Green-and-Gold, and after seeing former teammate Greg Gardner with the heralded “C” on his chest, Reddick knew that one day, he wanted that too. In the 2014-15 season, Reddick’s teammates rallied around the forward and voted him in as their next captain. 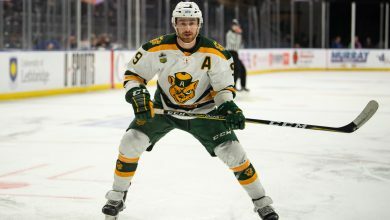 A tenacious leader on and off the ice, Reddick served as the Golden Bears captain for two years, winning a national championship in his first season at the helm. He’s been a “tremendous leader” and “tremendous individual” for the Bears, head coach Serge Lajoie said. And his resume, which includes three conference championships and two national championships, enforces that title. Which is why the transition to pro hockey was a little difficult, Reddick admits. He went from “the guy,” to “the new guy,” in just one week. Today, Reddick suits up for the Idaho Steelheads of the ECHL. He scored his first goal in a 4-1 win March 31 win over Utah Grizzlies, and was awarded a taped puck signifying the feat as a postgame memento. As exciting as it was for Reddick to net his first point in a brand new uniform, it’s something that hasn’t happened in five years. That win over the Grizzlies clinched a postseason berth for the Steelheads, as they moved into first place in the West division and fifth in the Western Conference. Reddick got as much out of the Golden Bears program as he could in his five years at the U of A. The fresh-faced forward who stepped onto that Clare Drake ice for the first time is a completely different player, size- and skill-wise, from the grizzled veteran today. 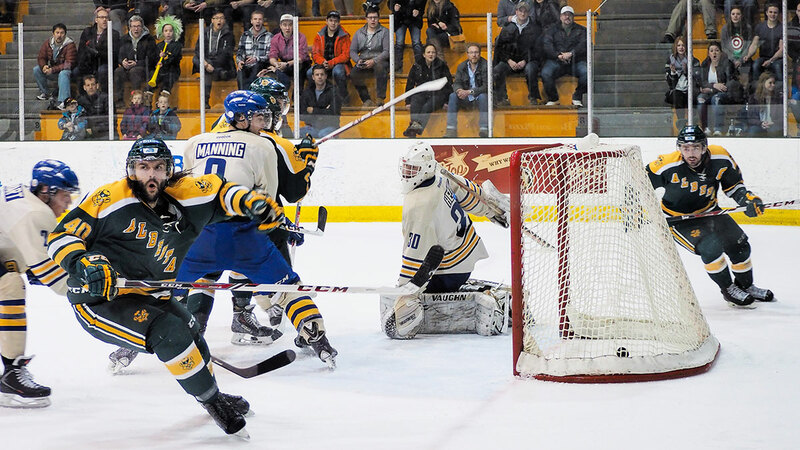 But the former captain’s time with the program taught him much more than how to fill a Canada West statsheet. Through four games with the Idaho Steelheads, Kruise Reddick has scored two goals and owns a plus two rating. Thomas Carr and Jordan Rowley shared a lot of similarities over their five years at the U of A. They both were raised in Edmonton, with Carr from the north side and Rowley from the south side. They each took a Bachelor of Commerce degree and shared similar — sometimes identical — class schedules. They both took a summer job with at the same time with KBR, an oil field module building company. But one thing made them almost inseparable — the blue line. 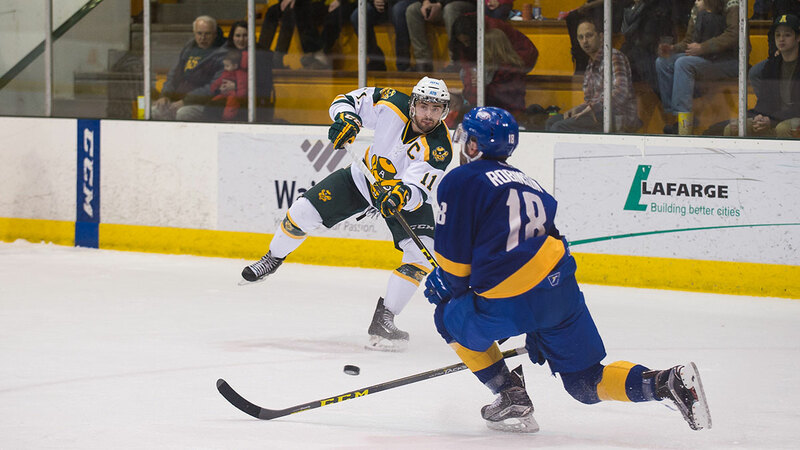 Carr and Rowley have been a Golden Bears defensive pairing ever since they entered the program in 2011-12. Both credit each other for their stellar play on defence, with Rowley winning Canada West Defenceman of the Year in 2012-13 and 2015-16, and Carr being named to the Canada West All-Star second team in 2015-16. Rowley deferred his DPOY win to his teammates, and especially to Carr. This April marks the first time the two won’t be on the ice together in what seems like a very long time. 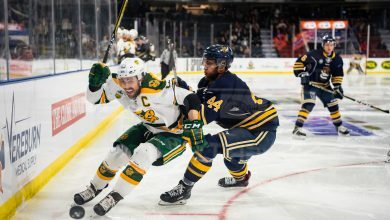 Following the Bears CIS National Championship loss in March, Rowley signed a pro deal with the ECHL’s Orlando Solar Bears, reuniting him with former Bears teammate T.J. Foster. Carr signed with the Allen Americans, who are primed for a postseason run in the ECHL. They both realize the difficulties of playing in a brand new locker room away from each other and the rest of the Golden Bears. Carr is still getting used to his new partner, Matthew Register, though the two have a shared starting lineup pairing since Carr’s arrival just last week. Carr said he wants to play pro hockey “as long as he can,” though he realizes how much teams rosters change. It makes the five year commitment to the U of A and his teammates in 2011-12 that much more memorable. Through two games with the Allen Americans, Thomas Carr sports a plus two rating with zero points. Jordan Rowley has posted a minus one rating in his two games with the Orlando Solar Bears. This year’s graduating class is special to Stan Marple. Yes, there are the two national championships and the three conference championships in the Clare Drake arena because of this group. But something else about this class makes it dear to Marple’s heart — it was his first recruiting class ever. Marple was handed the reins of the Golden Bears hockey program in 2011-12, and the class of Kruise Reddick, Levko Koper, Brett Ferguson, Jordan Hickmott, James Doborowski, Thomas Carr and Jordan Rowley were the first group he signed to the Green-and-Gold. They’re also the first of his he’s had to see leave. Marple recuits on two philosophies. The first is to come and play hockey by challenging themselves as individuals and becoming good students. When their career is over, he promises them that he’ll try to place them in a pro hockey gig in either Europe or North America. If they choose not to play hockey, he helps them secure jobs in their respective fields of study. He and video coach Michael Chan have been preparing game tape highlight reels and letters of reference for this graduating class since September. After setting the players up with Ross Lambert, a player agent who also represents Derek Ryan who suited up for the Carolina Hurricanes this season, six of the seven seniors currently find themselves on pro hockey rosters.